Marco Polo Travel Guide for 2008/2009, 2011/2012 and 2013/2014! hotel.de portal have rated this hotel as one of the best hotels in Heidelberg. 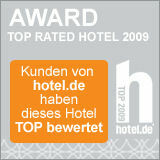 Guests who stayed at the Hotel Villa Marstall have rated this hotel as one of the best hotels in Heidelberg.